This is a very brief and incomplete history of things that have gone on at the FLC observatory. The Dome was put up in November. No gravel on road. The dome sat open to the weather over part of that first winter. The snow came early this winter, so there was a valiant trek through the snow to prop the dome closed and clamp it until spring. The floor had already been snowed upon, which was not so good for the plywood. Obviously no telescope out there then. On the FLC campus, a plywood deck was installed in room 503, and a set of tri-dollies was purchased to that we could begin hauling out the telescope and using it on the sidewalk outside of Berndt hall. The biggest job this summer was the fence. There was some mesh put around the base of the dome deck, but this was not fine enough to keep out mice. Power installed early summer. There were “issues” with the belt on the north side, so a reinforcing bracket had to be made. There was a seam in the fiberglass that looks like it never was “glued” together properly. When the dome was going up on that side, it would pull down on the rim of the wall, and the belt would then start wrapping to one side. It would eventually get far enough that it would slip off the spool and the door would suddenly “drop” open. Not a good thing, as this was in front of the door to get in. It resulted in lots of climbing in and out over the wall. Primed and then painted the floor. June first load of gravel 10 trucksx25tons. Learned about and installed roadbed liner. Telescope taken to observatory late summer 2004. Visual observations only. We had already had first light on campus. This summer saw the first iteration of the finer mesh around the outside of the dome deck. Jacob Nester dug the trench in front, but the other sides were not deep enough. Katherine caulked most of the dome, but we ran out of calk on the last seam. Brian cut the table to match the curvature of the dome. I repainted the floor. First light of camera through telescope was M82 on campus, in spring 2005. Initially, were doing “autodarks” with CCDOps, so each exposure automatically took a dark right after the light. Autoguiding was not attempted, and the first exposures taken by Katherine were uncooled. This was the first summer we were able to really start taking any pictures with the camera. June was the first version of M13. Katherine was very interested in getting her senior seminar data, so we took several night collecting “all night” runs of a globular to try to find some RR Lyrae variable stars. These images were almost all at full 1x1 resolution. September 1 was when we began linking images from CCDSoft to TheSky. A JMI moto-focuser was purchased and installed. The autofocus routines was very inconsistent to start with, and John came up with some “generally good enough” algorithms. Joanna Gordon's research was to observe the light curve of type Ia supernovae. We attempted to repeat the variable star globular cluster data with this time adding a color component. this was a long set that never got analyzed completely. we thought there would be time between the shots, but apparently not. John also took some galaxy shots and some Pluto shots. He was getting better at focusing and processing, but had not spent any time learning about the auto-guider. Summer 2006 we began using the autoguiding feature with the internal camera. The software is definitely designed for polar alignment, since the corrections sent to the scope are RA or Dec, and then the scope translates that into motion in two axes. Became aware of the dessicant that needed to be baked. Additional gravel was added to the access road. The entire section from the hay barn to the observatory now has 3” road base and should no longer be impassable in wet weather. The road will still need grading in the upcoming season, and several places on the access road up to the mesa need gravel. 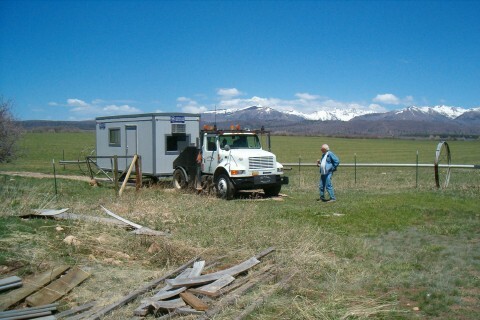 In April, received delivery of a 20’ trailer to be used as a warmer “control center” so that the telescope can be operated from an adjacent building. Started a trench for power to the trailer. The trench is approximately halfway dug. We explored the temperature control on the CCD and the resulting noise reduction available. There are still issues with apparent ice crystals when the temperature is set too low. Made the autoguiding CCD and software operational with this telescope mount. Developed algorithms for successful autoguiding in different parts of the sky with the alt-az mount. There are still issues with the smoothness of the altitude (declination) axis on the telescope, but in general, much longer exposures are now possible. Developed appropriate autofocusing software parameters for this telescope and rear-cell focuser. Consistent focusing is now much more achievable. There are still issues with the mirror shift as the temperature in the telescope change. This shift is inherent in the construction of Schmidt Cassegrain Telescopes and is not completely mitigated with the mirror lock. Installed a mirror lock and parfocal extension tube to make visual observations (and star parties) more compatible with photographic observations. Dustin Dvorak’s research was on H-R diagrams. Rebuilt north dome mechanism and installed new dome belts. Resolved issue with ice crystal formation by recharging an internal desiccant. Obtained and experimented with various photometric (UBVRI) and narrow band (Ha, OIII, SII) filters. Initial atmospheric extinction studies with Advanced Physics lab. Installed external 5” refractor for autoguiding while using narrowband filters. Installed additional adjustable counterweight system. Built aperture covers for flat field images. Built light box for flat field images. Shane Mayer-Gawlick’s research was on observing the eclipsing binary star Algol. Completed electrical power hookup to the trailer. Properly re-tensioned and braced rear corner of fence. Repaired fence gate. Obtained longer-travel focuser, to eliminate issues with having to move the primary mirror with various eyepiece/camera/focal reducer configurations. Installed an equatorial wedge. The new wedge was built by a local welder from my rough design, and machine drawings by Dave Miller of Durango Skies. Fine-tuned wedge orientation using drift alignment technique. This wedge allows much longer observing sessions without having to compensate for rotating flat field subtractions. Continued developing techniques for better and more efficient data acquisition and analysis. Wrote procedures for Advanced Lab Astrophotography processing. Upgraded the counterweight system (required with the new equatorial wedge). Repaired internal connections on LX200 Right Ascension motor cable. A right ascention drive connector on the mother board burned up and had to be replaced. While the base was disassembled, I did try to clean things up. The RA belt apparently got loose, as it needed tightening a few months later. Re-adjusted Right Ascension belt to reduce periodic tracking errors. This allows much longer exposure. Obtained and experimented with various data reduction software packages. CCDStack was especially useful. Learned numerous processing techniques using Photoshop. Worked on polar aligning the wedge, balance, tried different guide scopes, ballancing weights, and installed a new mirror lock. By the end of the summer we could (semi)regularly take a series of useable 10 minute images. Fine-tuned wedge orientation using drift alignment technique. This wedge allows much longer observing sessions without having to compensate for rotating flat field subtractions. Continued work on dome-control electronics. Designed Observatory web site. Data base information was created that included information on numerous observatory photos and data. 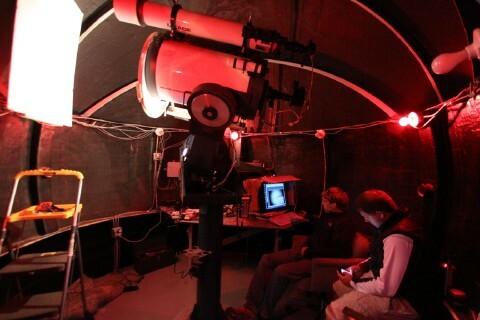 Web site is now “live” at http://www.fortlewis.edu/observatory. Obtained and experimented with various data reduction software packages, particularly CCDStack. Continued learning more post-processing techniques using Photoshop. Continued expanding our “archive” of color photographs of various deep sky objects, and posted these on the web site. Wrote a Laboratory Education Gift Program Proposal to Los Alamos National Laboratory for the 16” scope to be donated to Fort Lewis College. This proposal was accepted and completed during 2009. Wrote a Small Research Grant application to the American Astronomical Society for the purchase of a German Equatorial Mount to replace one of the broken Meade LX200 fork mounts to be used for the Advanced Physics lab classes to supplement the observatory 16” scope. This proposal was funded. 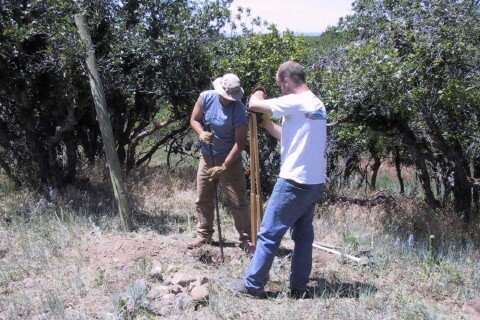 Students working: Chris Hardrick and Justin Revard. 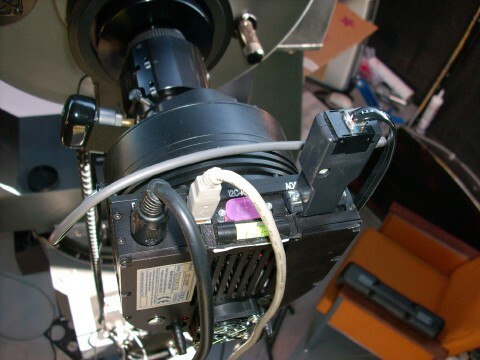 Installed an SBIG AO-8 in-line adaptive optics unit. This significantly improves the autoguiding capability in those situations where a suitable guide star can be found. Added active cooling via a water pump to the camera. Lower summertime camera temperatures (and less noise) can now be achieved. -35°C is now regularly achieved. Added a moveable camera stage to the external guide scope. Guide stars are now much easier to find, even if they are not close to the imaging target. Continued to tweak the mirror locking and focusing mechanism on the LX-200 telescope. Some issues have caused optical distortions from mirror pinching and also lead to focusing and guiding problems. Sixty image pages were added to the observatory website. Many were new images, but others show files used in processing data, filter transmission data, atmospheric extinction factors for various filters, or link to time-lapse videos. The first time the scope was started in 2012 the R.A. motor went out – the brushes literally fell apart. 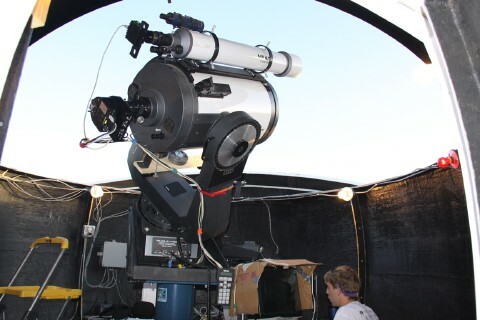 One of the 10” LX200 telescopes was installed as a temporary replacement. For a variety of scheduling reasons, not many images were taken. 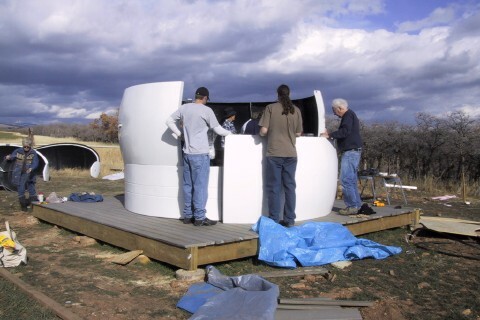 A second 12’ dome (in pieces) was donated and moved to the observatory site. The insulation under the trailer was replaced and a wire “rodent shield” installed. The Losmandy G-11 finally arrived with the updated Gemini-2 pointing computer. The Gemini underwent numerous firmware updates throughout 2011 and is still a work in progress. The mount has proven to be both portable and reliable, with mount options for a 10” LX-200 and also an ED80T-CF 80mm triplet apochromatic telescope for imaging. Several night time-lapse series of photos were taken using a Canon 50D. Student working: Justin Revard, John Naglak, Bill Fellman and Adam Baker. Internet Access was installed at the observatory. A new computer was installed at the oservatory. Obtained an Orion Starshoot as a guide camera. The sensor is slightly larger, slightly more sensitive, and slightly less noisy. Dimmer stars can be used for guiding.